Always dedicated defenders of tradition, we nonetheless believe that today the best way to respect the spirit of tradition is to embrace the potential of new developments, and certainly in those instances, for example, when something allows us to better preserve and highlight the typicity of the wines of the Langhe, the qualities of the grapes that go into them, and the characteristic of the various terroirs that yield them. 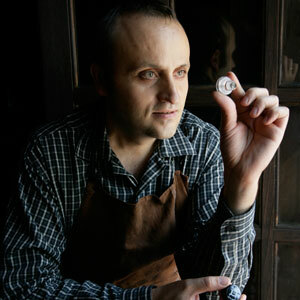 For centuries now we have been used to seeing the image of a top-quality wine, such as those we strive to produce, harvest after harvest, from our efforts in the vineyard and in the cellar, side by side with that of the detailed ritual whose most crucial moment is the uncorking of the bottle, with its slow removal of that cylinder of natural cork. This should be a magical, delicate moment, which can be utterly ruined, when, during the actual tasting of the wine, usually after being patiently stored for years in the cellar, one discovers, alas, that the cork has failed and disturbingly the wine tastes corked. This problem has become ever more widespread because the massive and steadily increasing demand for corks, fed by the exponential growth of bottled wine throughout the world, represents a serious problem for the cork producers, who are now having to move up, by years even, the harvesting of the precious bark from the cork oak forests, from trees that have not yet reached maturity or the correct thickness of the bark. Confronted with this unfolding scenario, the task of researching and experimenting with alternatives to the traditional cork closure becomes, for every wine producer, not only a neccesity dictated by the requirement for sound wine, but an unavoidable commitment as well. After lengthy considerations and several experiments, our winery believes that it has identified an innovative type of closure that is not only technologically flawless but, even more importantly, one that will provide consumers with just one more guarantee of our attention to the qualities of the wines we produce. The solution, which we have adopted for a substantial proportion of our production of Nebbiolo d’Alba, Barbera d’Alba, Dolcetto d’Alba, Langhe Freisa, and Langhe Chardonnay, is an innovative glass closure designed by a German multinational, Alcoa Deutschland. It owes its origin to the brilliant idea of a doctor, an amateur winemaker, who was inspired by the stoppers and bottles used in times past in pharmacies. This closure ensures a perfect, oxygen-proof seal and one that is absolutely sterile. It was not designed to lower costs, since it costs every bit as much as a high-quality cork, but solely to offer better protection for consumers, so that they would not find themselves being unpleasantly surprised and disappointed by the taste of the … cork. Made of glass tempered at 500°C, then pressed and boiled, it is one hundred times more resistant than the wine bottle itself, and it provides a hermetic seal, thanks to a ring gasket in a neutral material (Elvax), containing no PVC, which also will not abrade the bottle. The gasket comes into contact with the wine in a space that constitutes only 3% of the open surface of the bottle, effectively keeping oxygen from entering. This extremely practical glass cork substantially simplifies serving the wine as well, since the “uncorking” no longer requires a corkscrew but can be done just with the hands. The outer aluminium capsule is removed first. It serves both to protect the stopper and to provide a security seal. 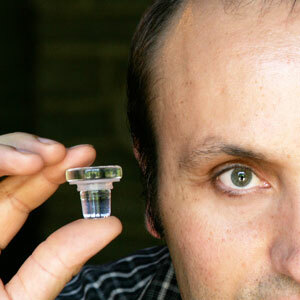 Then the glass stopper is pushed up gently with the thumb. The entire operation takes but a few seconds. 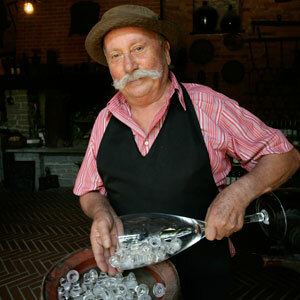 Once opened, the bottle can be re-stoppered quite easily, and as many times as one wishes. Our decision to utilise the Vino-Lok should not be considered as a complete rejection of the classic cork, because until the production regulations change for the fine wine, the classic cork will still be fundamental as it is forbidden for the DOCG to use alternative closures. Rather, it signifies a commitment to promote better consumer confidence and a desire to search out improved methodologies. You can gain a clearer idea of this closure by accessing www.vinolok.cz, or, even better, by trying one of our wines that utilise it. 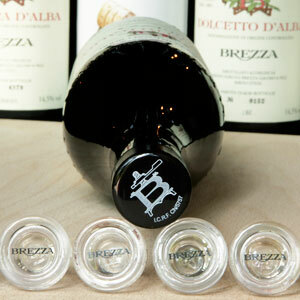 Thanks to these new glass seals, the disaster of unpleasant problems created by the cork has been finally eliminated.